A phoenix making its roost atop Mr. Stravinsky's home. 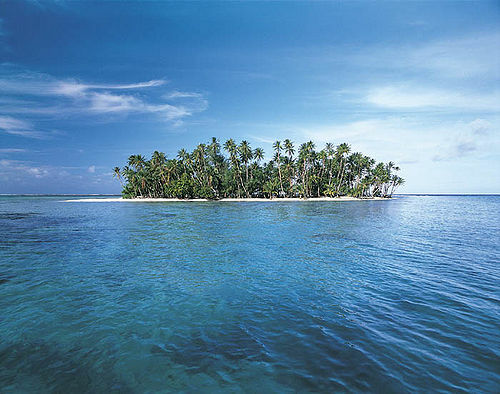 The Phoenix Islands are an archipelago of various islands, located quite a long way from anywhere. Apart from a small American army base on one of the islands, Igor Stravinsky, and some rare coral and fish lying about, the islands are entirely dominated by Phoenixes. 5 Now what's all this about Igor Stravinsky? Phoenixes live there. They really do! Phoenixes! Where'd you think they came from, made up out of thin air? A highly suspicious-looking Google Earth map of the islands. There are five islands in all, each separated by small straits of water (as islands in archipelagos usually are because, in reality, they are just one big island with some water slooshed around in their canyons). The only way mankind can reach the islands is to keep sailing west if you live east of them, vics versa if you're coming from the other way, or to point your bow north or south if you're traveling from another direction altogether. The Phoenix Islands enjoy a healthy consensual relationship with the Canary Islands. What better place to live than a plethora of out-of-the-way islands named after you? Since no large groups of humans are scampering around, cutting down trees and whatnot, generally making a muck of the place as they are wont to do, Phoenixes get on quite famously there. They can easily fly between the islands, enjoy the five different kinds of sands found in the archipelagos, and live a life of avian leisure. Then, when it is time to die, the Phoenix just flys on over to Warm Island, dies, and is soon reborn. A piece of cake, that! Igor Stravinsky. Although thought long dead, Mr. Stravinsky is the only human, apart from the residents of a small American army base, who actually lives on Phoenix Islands. He has retirement homes on both Arizona Island and Sun Island, and the Phoenixes love him. That Phoenix in Harry Potter, I think it began with an 'F'? And some fish. Rare fish. Now what's all this about Igor Stravinsky? Mr. Stravinsky often writes notes, puts them into empty bottles, and throws them into the sea. Born in 1882, composer Igor Stravinsky died in 1971, or did he? Turns out that Stravinsky faked his own death and moved to the Phoenix Islands, which he had once visited on a Russian goodwill tour of a small American army base. Stravinsky, now almost 130 years old, has died many times, and each time has risen like a Phoenix from his own ashes. The Phoenixes, of course, recognized that Stravinsky really loves the Islands as much as they do and taught him the rising-from-your-own-ashes trick. It isn't that hard, actually, but you have to have a good constitution, a keen curiosity, and a knack for laying aside any doubts. Mr. Stravinsky now spends his days strolling the beaches, composing music, and eating rare fish. He is happily married to his seventh wife, Helen, a private at a small American army base. 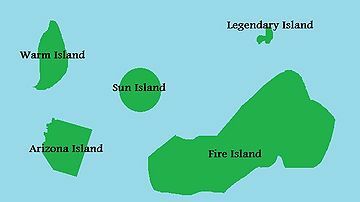 Legendary Island was once twice as big, and fitting of its name. But the guys over at a small American army base forgot to mix reason with conclusion, as is their sorry lot in life, and shelled it for no apparant reason. A few Phoenixes were killed in the bombardment, but they came back without a scratch. The rare fish, not so much.